This 6 foot Recycled Plastic Park Bench is the Park Place style bench with a back. Outdoor park benches like this one looks great standing alone or in a repetition at school campuses, zoo, public parks, hiking/biking trails and tennis courts. 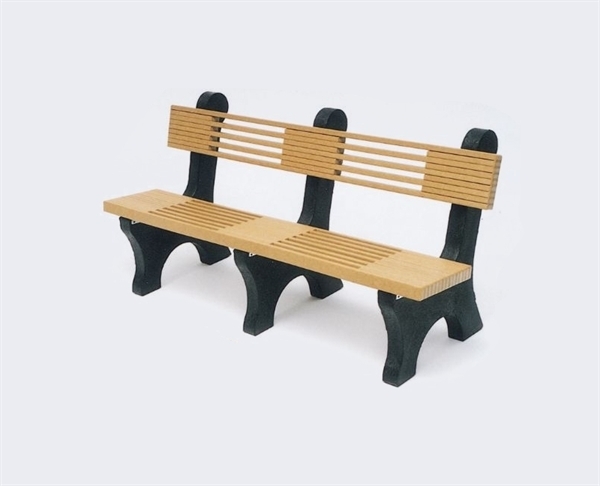 The distinctive slat design and our thick-walled, solid, recycled plastic frames make these comfortable benches the solution to the maintenance problems of concrete and treated wood benches. The color of the plastic bench frames is black only, slats are cedar. Benches ship fully assembled. Weight: 117. ADA Wheelchair Accessible Rectangular Picnic Table 8 Foot Recycled Plastic, Portable, 365 lbs.